The 38 foot A Scow is the most powerful inland scow sailboat and will reach speeds of 25 mph in a good blow. 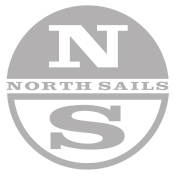 Our commitment to making the fastest A Scow sails is proven in the results, because top A Scow teams choose North Sails. The All-Purpose Tri-Radial jib is the perfect compliment to the Light Speed jib for when the breeze is up and speed is key. This sail has a very wide range and will be fast in all conditions! The Ultra-Light Tri-Radial jib is made out of Kevlar and the name says it all. This sail is a must for ultra-light conditions! The name says it all. This spinnaker is the only sail to win every championship since 1998. The Whomper is constructed with high quality AirX 600 fabric which is built for performance. The name says it all. The Whomper is the only sail to win every championship since 1998. The Whomper is constructed with high quality AirX 500 fabric which is built for performance. The Runner/Reacher is the perfect compliment to the Whomper when the breeze has gone soft or when it is really pumping. High quality AirX 500 fabric is used for ultimate performance and durability. This sail is approximately 20% smaller than the Whomper and compliments the Whomper nicely, filling in the range from 0-8 mph and again this sail is fast when the wind is over 18+, especially in waves. A great addition to your inventory! Made out of AirX 500 spinnaker cloth.